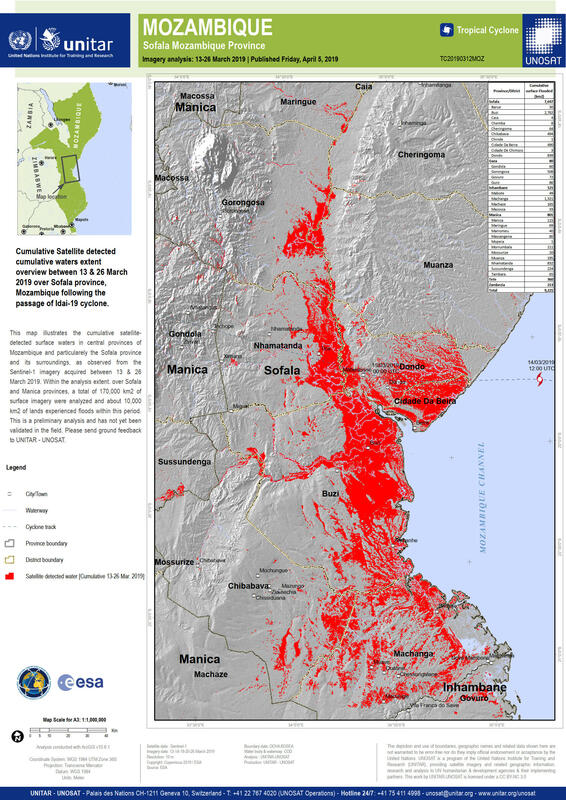 This map illustrates the cumulative satellite-detected surface waters in central provinces of Mozambique and particularely the Sofala province and its surroundings, as observed from the Sentinel-1 imagery acquired between 13 & 26 March 2019. Within the analysis extent. over Sofala and Manica provinces, a total of 170,000 km2 of surface imagery were analyzed and about 10,000 km2 of lands experienced floods within this period. This is a preliminary analysis and has not yet been validated in the field. Please send ground feedback to UNITAR - UNOSAT.